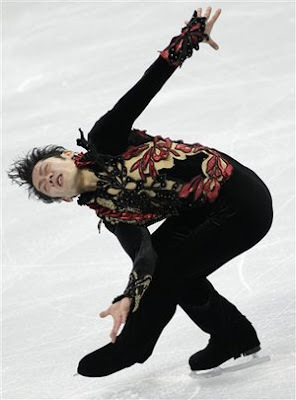 I enjoy watching the Olympics for the reasons of global unity, witnessing the talented athletes in awe, and specifically, men's figure skating. Now that's a Chad Michael Michael move. Now, don't get me wrong. I can appreciate the talent these guys have as you will not find me attempting double sow cows and triple lutzes or even spinning for days. However, there was a time of my life where I applied rhinestones to anything I could get my hands on, but that's about all we have in common. The figure skating competitions are pure comedy to watch. Scott and I (much to his chagrin) gather 'round the telly and watch these serious guys mentally prepare walking down the arena halls with their ear muff-like head phones, visualizing the routine. 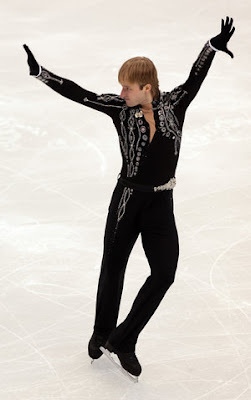 You see them stretching out in their J-Lo v-neck costumes that connect to their skates (how do they do that??) and emblazoned in rhinestones. It's an awesomely hot mess. Now if you happen to be a men's figure skater/dating one/married to one, please don't think I am criticizing, I mean come on, we haven't touched on curling. 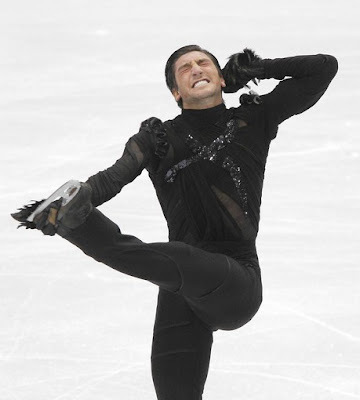 The routines that are performed truly seem like the same components interspersed with freestyle ice dancing. They start with a triple lutz or some other fancy move (and Scott Hamilton will generally exclaim how amazing it is executed), followed by some wide arm fly-skating past the judges into a second trauma-inducing jump, more skating around freestyle, and ending with a 5 minutes of spinning in the center of rink. It's such a formula-doesn't anyone else (hello, looking at you judges) notice that? The sheer seriousness and rhinestones are what mostly get me though. I know these men train as much if not more as everyone else at the Olympics. They just get the comedy gold from me.